"I wish I could have had the opportunity to have Lonnie teach and mentor me 25 years ago." 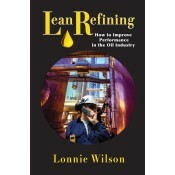 "Lonnie Wilson merges his extensive knowledge and experience of both lean manufacturing and refining in an easy-to-grasp way." "I have found in Lonnie Wilson a rare combination of both passion for, and the ability to clearly communicate, the principles of continuous improvement." "It is simply uncanny how he breaks down complexity to deliver valuable insight and, most importantly, solutions that work." "No matter what your business, the principles identified in this book can positively change your company’s operating and financial results—and your management skills.... I highly recommend it." Lean Refining: How to Improve Performance in the Oil Industry addresses the tremendous opportunities this quality improvement system can exploit to achieve huge financial gains, while simultaneously improving morale, timeliness, quality, safety, reliability, and environmental performance. The book offers numerous examples of how lean methodologies can be applied, the gains that can be achieved, and takes readers through a prescriptive process of implementation. The book is divided into 3 parts. Part I is specific to the topic of lean manufacturing, and explains exactly what lean is… as well as what it isn’t. Part II addresses lean manufacturing in the oil industry in general, and refining in particular. It explains why lean is not the prevalent improvement strategy in refining, and why it’s more likely to appear among the smaller companies first. It also explains the differences that petroleum refining brings to the lean model. Part III covers topics needed to understand how to implement, organize, and roll out a lean transformation from the top down. An affiliated website boasts tons of valuable information, including: Forms and evaluations for such topics as The 10 Lean Killers, The 6 Roll Out Errors, The 5 Precursors to a Lean Transformation, and more; Samples of working documents such as A3s, Leader Standard Work, and 5 supervisory tools, in both template form and completed; A comprehensive reading and reference list of nearly 500 resources, broken into topical material; Links to 3rd-party websites where readers can download e-forms and other related information. Lonnie Wilson, a Certified Six Sigma Master Black Belt and Six Sigma trainer, has been teaching and implementing Lean techniques for 40 years. His experience spans 20 years in manufacturing management with an international oil company. In 1990, he founded Quality Consultants, which teaches and applies Lean techniques to small entrepreneurs and Fortune 500 Firms, principally in the US, Mexico, and Canada. Mr. Wilson has taught for the El Paso Community College and the University of Texas at El Paso, and is an active Senior Member of the American Society for Quality Control. He has spoken at the iSixSigma annual Petroleum Energy Conferences, Industry Week, Honda Lean Suppliers Network, APICS, ASQ, and ARM (Association of Rotational Molders) Annual Conferences. Wilson is the author of the highly successful, How to Implement Lean Manufacturing, published by McGraw-Hill. Why Is Lean Manufacturing So Misunderstood? How Much Has Lean Penetrated the Refining Business? Where Will Lean First Appear in the Refining Industry? How Can Lean Benefit the Refining-Focused Businesses? What Differences Does Petroleum Refining Bring to Lean? Notify me of updates to Lean Refining in the Oil Industry Sale!